Italian design houses may have well-known names, but it's pretty rare for them to market cars under their own signatures. It could be said that motor shows have lost a little of their glitz and glamour in recent years as more and more concepts appear to be production-ready models instead of being the outrageous design exercises they once were. 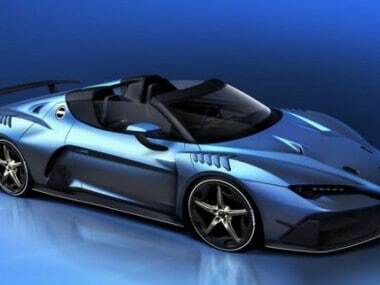 Italdesign is a company that's definitely going to be putting some of that glamour back into the Geneva Motor Show next month by showcasing its stunning new Zerouno Roadster. Italian design houses may have well-known names, but it's pretty rare for them to market cars under their own signatures. The likes of Zegato may have been added to coupe models from Aston Martin, Lancia and Alfa Romeo in the past, but it's quite unusual for the design house to also be the manufacturer. Italdesign had never sold any cars of its own until it introduced the Huracan-based Zerouno, and it now intendeds to introduce a new model under its own brand name every year from now on. The Zerouno coupe was the first, and now the company has revealed a convertible version that's going to be on display at this year's Geneva Motor Show. But in the true tradition of hypercars, the production run will be incredibly limited, and each car will cost a fortune. And when we say a limited production run, we're talking single figures. The coupe was restricted to just five examples, and it's unlikely there will be many more than that number made of the stunning roadster version. Of course, along with such exclusivity comes a matching price tag. Although prices for the convertible haven't been officially revealed just yet, it's believed the base price is going to be somewhere in the region of 1.5 million euros ($1.8 million), and will easily go much higher when highly desirable options are added. And the performance will match the styling: under the hood is a 5.2-liter V-10 that will get the Zerouno from 0 to 6 mph in just three seconds, and onwards to a top speed of 205 mph.